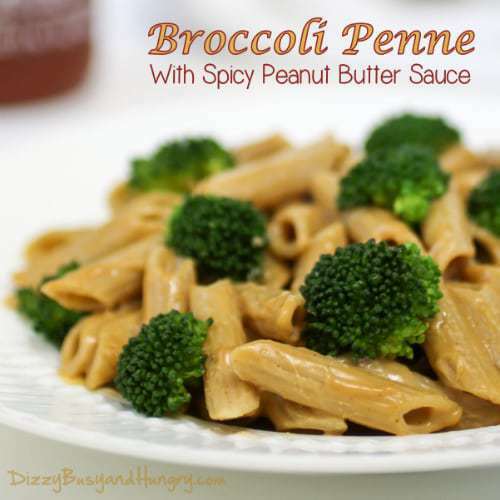 Broccoli Penne with Spicy Peanut Butter Sauce | Dizzy Busy and Hungry! My kids love pasta, so I am always looking for variations from our typical pasta-based fare just to keep things interesting. Of course, we will never abandon one of our standard favorites, spaghetti and meatballs (affectionately known as ‘speggy and merbles’ in our house! ), but sometimes it is nice to try something completely different. 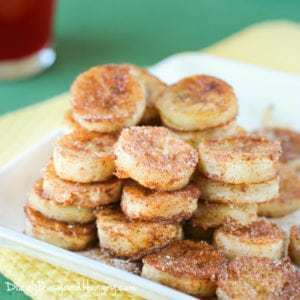 I love this recipe because it is so easy! Just boil your pasta, steam your broccoli, toss with the sauce, and you have a complete meal in one dish. It is fast, too, especially if you steam your broccoli in the microwave. While the pasta is cooking, I quickly zap my broccoli and mix up the sauce, and then by the time the pasta is done everything is ready to go! When I am able to be very efficient (no interruptions to help with homework, or sign test papers, or answer the phone! ), I can get this dinner on the table in 20 minutes! Woo hoo! I was a little anxious as to whether Thing 2 would like this dish, because of the sriracha sauce. In general, he does not like spicy foods. So I kept it on the mild side for this recipe, but you can always jazz it up with a little more sriracha if your family likes a bit more kick! DH and Thing 1 were totally on board and really enjoyed this recipe. DH added a bit more sriracha to his portion. Thing 2 was hesitant, but he is really good about trying new dishes, and in the end he did enjoy it! (3.5 out of 5 biscuits). 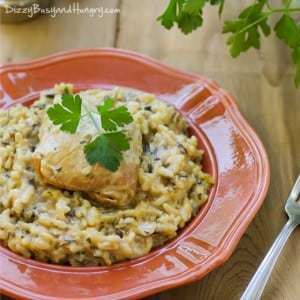 A delicious departure from the usual pasta sauce with a creamy sweet and spicy flair! Cook the pasta to al dente, according to package directions. 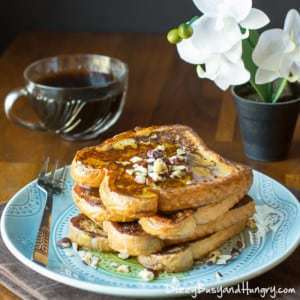 Combine the peanut butter, water, maple syrup, soy sauce, ginger, and sriracha sauce and mix until smooth. Combine the sauce with the pasta and broccoli and toss to coat. I’m not sure how I missed this recipe last year. Yum! Since I’m gungho about lowering calories, I substitute PB2 for the peanut butte r and that cuts the fat to almost zero. 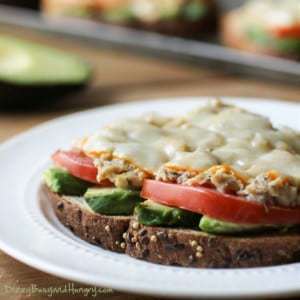 Although I always prefer non-processed foods, I’ll occasionally use PB2 because it’s such a great substitute for peanut butter in recipes that call for a lot of peanut butter (and fat). I buy organic PB2 because, in the defatting processing of peanuts, any pesticide would be concentrated in the final product — so it’s best if they start with peanuts that haven’t been subjected to pesticides. It doesn’t make much sense to spare your body from a lot of fat and then subject it to a lot of pesticides! This looks great Kristin!! I love the addition of the peanut butter which makes everything taste wonderful. Thanks for sharing! I know, it is hard to go wrong with peanut butter, right? 🙂 Thanks for stopping by, Sandi! I love peanut sauce and Kristin this looks fantastic! Thanks for sharing on the weekend re-Treat link party. Hope you link up to the party again tomorrow! I love your balance of spicy and sweet in this dish. Thanks for sharing it with us on foodie friday. This looks like a fantastic recipe. I’m vegetarian and love slightly spicy pasta dishes! You had me at spicy peanut butter sauce. 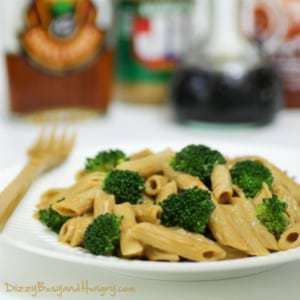 What a great idea to combine the broccoli and pasta with a wonderful flavor. Thanks for sharing. This looks delicious! 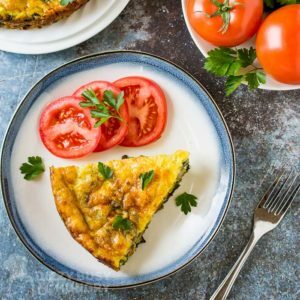 We will definitely be trying out this recipe soon!